Welcome to Congressman Donald Payne, Jr. | Congressman Donald Payne, Jr. Congressman Donald M. Payne, Jr. (NJ-10) released the following statement today on former FBI Director James Comey’s testimony in front of the Senate Intelligence Committee. Congressman Donald M. Payne, Jr. (NJ-10) joined Amtrak representatives for a Portal Bridge site tour and a briefing about the condition of the bridge and the larger Gateway Program for rail infrastructure improvements along the Northeast Corridor. The U.S. House of Representatives passed the Homeland Security for Children Act (H.R. 1372), legislation introduced by Congressman Donald M. Payne, Jr. (NJ-10) to incorporate children’s needs into disaster preparedness planning. The U.S. House of Representatives passed legislation introduced by Congressman Payne, Jr. to make it easier for first responders to acquire new equipment and technologies needed to respond to evolving threats. 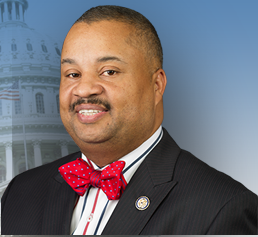 Congressman Payne, Jr. announced his appointment as Ranking Member of the House Homeland Security Subcommittee on Emergency Preparedness, Response, and Communications for the 115th Congress. Seventeen years after a deadly fire, U.S. Reps. Donald Payne, Jr. and Bill Pascrell, Jr., U.S. Sen. Robert Menendez, and fire safety advocates announced a new introduction of the Campus Fire Safety Education Act. Congressman Payne, Jr.’s State and High-Risk Urban Area Working Group Act (H.R. 4509) was included in the National Defense Authorization Act for Fiscal Year 2017 that won House passage. Congressman Payne, Jr. launched the 10th Congressional District’s First Responders Working Group with a meeting of emergency response partners on lessons learned from the recent bombings in New Jersey and New York and the importance of strengthening coordination between first responders and law enforcement at the federal, state, and local levels. The U.S. House of Representatives passed legislation introduced by Congressman Payne, Jr. to make it easier for first responders to acquire new equipment and technologies they need to respond to evolving threats. Congressman Donald M. Payne, Jr. (NJ-10) spoke on the House floor as House Democrats staged a sit-in to demand Republicans hold a vote on legislation to address gun violence. Connect with Rep. Donald M. Payne, Jr.
As a native of Newark, I am honored to represent the 10th Congressional District of New Jersey.